Home > What’s Learning World Series? The Learning World series is not just about students having fun while learning English. It carefully considers Japanese children’s age and developmental stages. From one level to the next, there is some overlap, gradually expanding and increasing the language used. This gradual expansion allows children to confirm the language they already know, while naturally recognizing and accepting new language. The entire Learning World series has been carefully designed to meet these goals of naturally acquiring language. 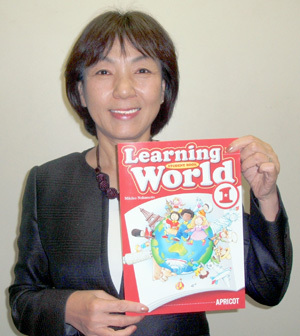 The books in WELCOME to Learning World can be used with beginners from preschool age; their basic design is a picture book packed with chants, songs, dialogues and activities. The backbone of the eight-book Learning World series is Book 1, Book 2 and Book 3, which were revised in 2008 and 2009.The books’ new design is a truly unique course book which incorporates an effective 2-page spread focusing on communication activities, and uses well-established chants and dialogues to efficiently remember language. READY for Learning World condenses essential English into one text and is designed so that upper-level elementary students studying English for the first time can effortlessly understand and enjoy English. 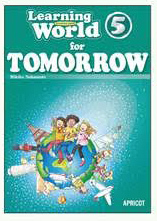 Learning Wold for TOMORROW, the highest level in the series, incorporates more creative writing and its aim is for students to gain a better command of language they’ve learned so they can easily express themselves in English. For: Children aged 3 to 5. WELCOME to Learning World PINK tells about the daily life of a 3-4 year old child. It uses chants, dialogs and songs with fun actions to introduce communication between mother and child. The daily scenes include get up in the morning, have breakfast, go to a playground, go out with mother, put the toys away, go to a supermarket with mother, take a bath, put on pajamas, and go to bed. Each unit has Arts & Crafts material (in the Student Book), using TPR to reinforce language. For: Preschool children who have finished WELCOME to Learning World PINK / children from 4 to 7 years old who are studying English for the first time. Learn English through fun songs, chants and simple dialogues! The level and amount of material makes YELLOW a perfect picture-based textbook for kindergarten through elementary school second grade. It covers the following topics: Greetings, Numbers, Family, Colors, Body Parts, Alphabet, Animals, Food, Playground, & TPR. BLUE is the same level as YELLOW! It covers similar topics but with slightly different language and vocabulary. A great text to slowly expand children’s language ability and build their confidence. Like YELLOW, BLUE uses fun songs, chants and dialogues with wonderful picture spreads to stimulate children’s interest. It covers the following topics: Let’s play together, Greetings, Numbers, Colors, Alphabet, Animals, Family, Food, Body parts, Transportation, On/in/under, Seasons, & TPR. For: Lower elementary school students who have finished WELCOME YELLOW and/or BLUE. Get students to really say what they want to say through Communication Activities, Oral Presentations, & Original Chants. Fun pictures, songs & chants make it easy for students to remember new language. Introduces phonics, and basic reading and writing skills. It covers topics, including countries & greetings, emotions, body parts, fruits & vegetables, animals, weather, time, months, days of the week, stationery, etc. Main characters: Jamie (7), Jamie’s family, Jamie’s friend Sara. For: Children who have finished Learning World Book 1 or 2, and for beginners of ages 8-9. It can also be used alongside Books 1-3 to add extra content. READY for Learning World is different from Books 1-3. READY is based on situational themes, instead of grammatical structures. The situations in READY revolve around school & home situations of elementary school children. Main characters: four children from Canada, China, Mexico, and Thailand. READY also helps students think globally and relate to children from other cultures. For: Students who have finished Learning World Book 1 and/or READY. Learning World Book 2 follows the same structure as Book 1, with great activities to get students thinking and talking on their own. At this level, students are expected to start writing simple sentences. It covers some new topics, including shapes, school subjects, rooms, vegetables, buildings, prepositions, opposites, sports, ordinal numbers, job titles, etc. Main characters: Mark (9, Canada), Yumi (Japan), Min (China), Nelson (Brazil), & Ema (France). For: Students who have completed Learning World Book 2, and for students who have had 4-5 years of English education. Learning World 3 follows the same unit structure as Books 1 & 2, but the content is written to reflect the needs of upper elementary students and help them as they are becoming more aware of the world around them. At this level, students are expected to be able to begin writing short paragraphs. Introduces past and future tenses. For: Students who have finished Learning World Book 3 and/or CHANTS for Grammar, for upper elementary to junior high students. Learning World for Tomorrow is designed to help students consolidate and master previously learned language. Tasks include creative writing and making presentations about themselves. This textbook is really to further language education that doesn’t have specific right and wrong answers. It includes topics like environmental issues and bullying, with the ultimate goal being to foster students’ self-esteem. Main characters: Rick (12), Rick’s family, and Rick’s friend Kelly. For elementary 2nd and 3rd grades students studying English for the first time, should I use BOOK 1? Or YELLOW? It is recommended to start with YELLOW at this age. For lower elementary school students, we recommend building a foundation with YELLOW (for about 1/2 a year) and then proceeding to Book 1. What is the difference between the Student CD and the Teacher’s CD? The Student CD contains selected tracks from the Teacher’s CD. The Student CD does NOT contain karaoke versions, communication activities and listening tests, which are only on the Teacher’s CD. What is the difference between the flash cards and the activity sheets (Kyogu)? The flash cards are for practicing vocabulary, and the activity sheets are for “using” English to communicate. The activity sheets feature a variety of activity types relevant to the Communication Activity. I’m planning to use READY after Book 1, but READY is for upper elementary beginner students. If I use READY after Book 1, aren’t the contents the same? Is it too difficult for students to go from Book 1 to Book 2? Students can go from Book 1 to Book 2. The reason we recommend using READY between Book 1 and Book 2 is to give students more practice “using” English. READY after Book 1 helps with the slow spiral of increasing level, and helps students better remember and consolidate language. Does the Teacher’s CD-ROM for Books 1, 2 and 3 work on Windows 7 & 8? What about Mac? The CD-ROMs are compatible with Windows 7 & 8. ★For Mac users, please purchase the Windows version and contact APRICOT. We will send you Mac version.